I would like some information on know to how set up a Difference-From-Control Test in SIMS Sensory Quality Software System. Also the Dunnett's T Test. This document describes how to set up a Difference-From-Control Test in SIMS software. This test is also known as a Degree of Difference Test (DOD). To jump right to Dunnett's T Test see #6) below. Determine whether there is a difference between a control (reference) sample and one or more other samples. Estimate the degree of such difference(s). Questionnaire example showing both an hedonic scale and a line scale. Present to each panelist the control (reference) sample plus one or more additional samples. Panelist will rate the degree of difference between each sample and the control. Explain to panelists that some of the test samples may be identical to the control. While it is acceptable to ask the panelists other questions about each sample, for the purpose of this discussion assume that the difference-from-control question is the only one on the test. Create a questionnaire, Affective type, perhaps named DIFF_CTRL (reusable for future studies). For a Line Scale the Minimum Value should be 0 associated with a description of "No Difference." The Maximum Value should correspond to a description like "Very Large Difference." The scale can be either continuous or incremental. Reference Points associated with mid-level degrees of difference may be included to aid the respondents. Question Example: Please rate the level of difference for Sample nnn relative to the control sample. Set the "Attribute Seen With" option to "All Samples." Note: This forum topic and the notes below are about presentations which include Control vs Blind Control. - For a simple Control vs Test we recommend a simple 1 sample study, a DOD type question, and after the test, review your raw data, means, standard deviations, and other statistical methods of your choosing. - For a simple Control vs Test1 + Control vs Test2 we recommend a simple 2 sample study, a DOD type question, and after the test, review your raw data, means, standard deviations, and other statistical methods of your choosing. - skip all of the notes below. For Control vs Blind Control , Control vs Test1 , Control vs Test2. This is a 3C3 design. and very similar if just Control vs Blind Control , Control vs Test1. This is a 2C2 design. and very similar Control & 3 test samples. This is a 4C4 design. The Experimental Design must be a Complete Block design such as 3 Samples see 3 in order to employ the Dunnett Test when the statistics are generated. It is recommended that Sample Order be randomized within each block to eliminate positional bias, which is called a "Balanced Complete Block". The Control or Reference Sample is USUALLY designated as Sample 1 in the Experimental Design. Each Sample Set presented to a panelist will always include a sample labeled as the "Control" or "Reference." In addition the panelist will also be presented with each of the samples labeled with a three-digit Blinding Code. The panelist will first taste the Control sample, then they will taste the 3 blind coded samples, one at a time, rating the difference from Control. In this example, the Experimental Plan should be Permutations 3 choose 3 (blocks 1 2 3 randomized). So the panelist will compare the Control with each of the blind ordered samples. Exactly one of the ordered samples will be the same as Control, but panelist will not know which one. Create a new Test Definition by selecting your new Questionnaire and Experimental Design. Use whatever Panel Type option works for you. Print the Rotation Plan for the technician to prepare the ballots properly. In addition, have the technician also prepare a Control sample to include with every ballot. Create a new Test Result Code, using the Test Definition above. You may need to explain to the panelists that the SIMS Sample Verification Prompt will not include the Control or Reference sample. However, each panelist must have this Control sample to complete the test properly. This explanation may be important to those panelists used to the presentation of SIMS Duo-Trio tests, which explicitly include the "REF" sample in the Sample Verification Prompt. 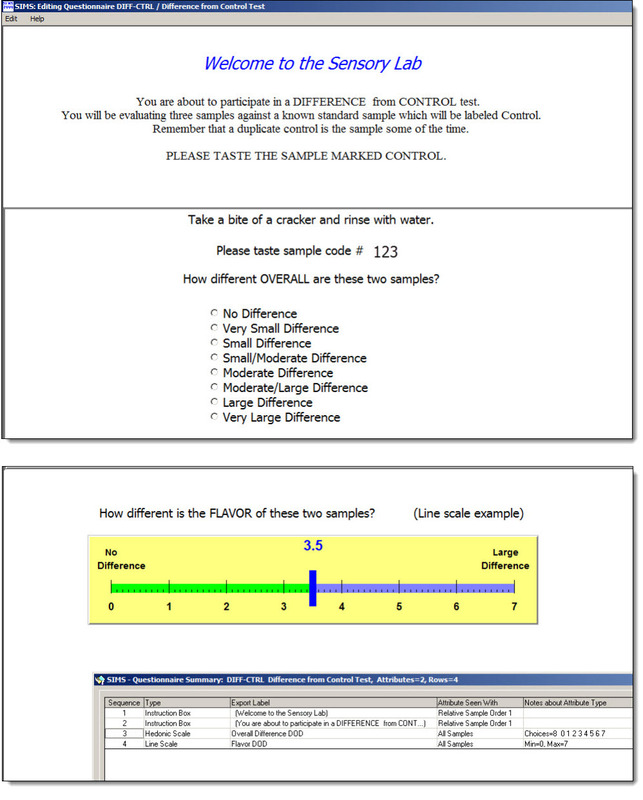 Used for Multiple Comparison Analysis of a Difference from Control test. The Dunnett's test is similar to the Tukey test, but Dunnett's only compares your Control Sample with each of the other test samples, i.e., a Difference from Control test. 1 vs. All. Sample #1 is generally the default Control Sample for Dunnett's statistics. The Default for your Control Sample is "1 vs."
Optionally you can specify a different Control Sample for Dunnett's statistics via the list box shown, "1 vs.", "2 vs.", "3 vs." etc. SIMS OUTPUT REPORTING NOTES: SIMS Dunnett's output. P-value: The P-value on the main TABLE is NOT the reliable indicator of significance for Dunnetts Test. This is because the TABLE's P-value shows significant difference amoung ALL the Test Samples, ANOVA. For your Dunnett's T-Tests you should be looking at the individual significant differences between 1 vs 2, 1 vs 3, 1 vs 4, etc. See your Dunnett's P-values in the TABLE's additional columns labeled 'P-Value Dunnett 1 vs 2', 'P-Value Dunnett 1 vs 3', etc. To further interpret your Dunnett's statistical results, go to 'View Analysis Files', and click on 'Statistics Output File'. Go to the R Section labeled '--- Dunnett's Results DVn ---' to determine your individual pairs significance. Your Individual pairs significance levels will be shown to the right of each p-value. See the value for 'Minimum Significant Difference' (MSD), compare this to the individual values for 'Difference Between Means' (DBM). If your DBM is greater than MSD (ie. DBM > MSD) then that Control vs test sample pair combination is YES significantly different. If 0 (zero) is not in the interval value range, then the pair is NOT significantly different. then the pair is NOT significantly different. If 0 (zero) is in the interval value range, then the pair is YES significantly different. then the pair is YES significantly different. In this example, both sample comparisons 1 vs 3 and 1 vs 2 are significantly different. Go to the SAS GLM Section labeled 'Dunnett's t Tests for Xn' to determine your individual pairs significance. Comparisons significant at the 0.05 level are indicated by ***. See the Dunnett's T Test Notes in your SIMS system for more information.